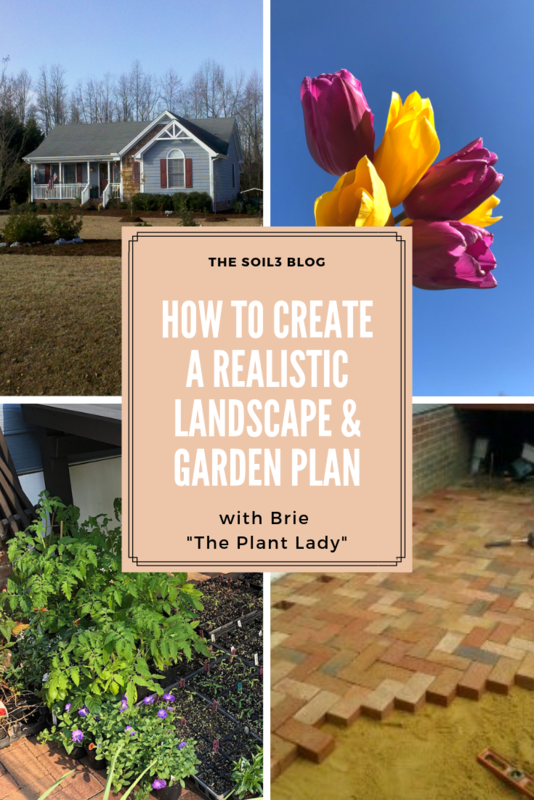 Brie Arthur reprises her role as featured guest blogger to help you make a realistic plan for planting this spring and beyond. 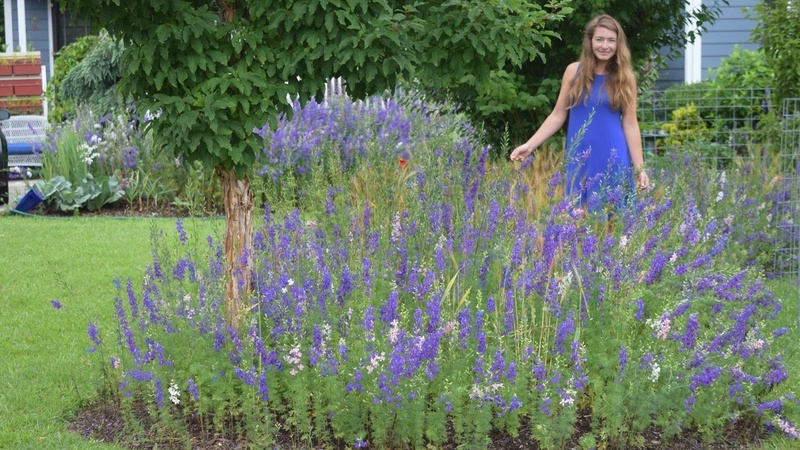 It is officially my favorite season and the list of landscape projects keeps on growing. Sometimes I feel overwhelmed and wonder how on earth will I get everything done? Even with daylight savings there never is enough time! Then I remind myself to take a step back, enjoy the season (and try to ignore the pollen) and get started on making a plan. 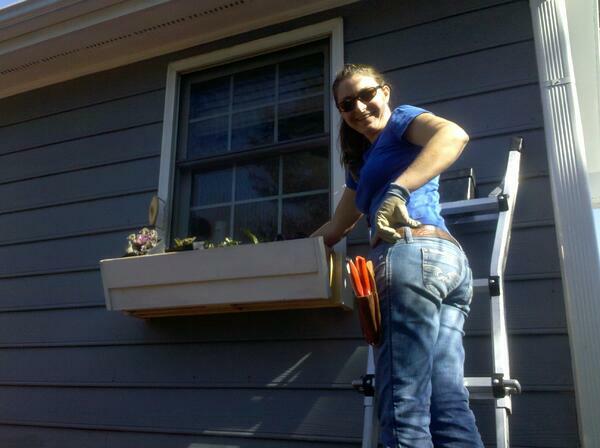 Here I am tackling a window box project during my first months of landscaping and beautifying the outside of my current house. I know, some people aren’t planners, but by nature I am. 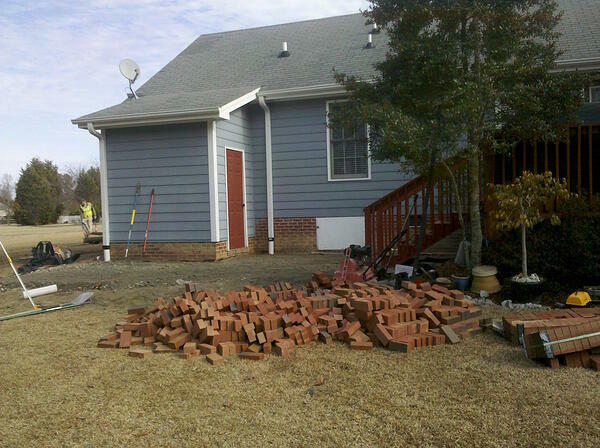 And when it comes to landscape and home improvement projects, having a plan is extremely important. Without one, a project can snowball and suddenly you are far more involved that you ever intended. Trust me, I know this from experience! The first step in planning is to make a list of the projects you want to complete. Complete is the important word here. Feel free to make a dream board of all things you hope to do in your home garden, but focus on the most important goals and work from there. A half started project DOES NOT COUNT! I recommend starting with up to 8 concepts and then prioritize them. You may find some overlap in time and resources so group those together to maximize your efficiency. Consider, realistically, how much time it will take to complete a project and note that on your list so you are reminded over the course of several weeks to stay focused on the job at hand. 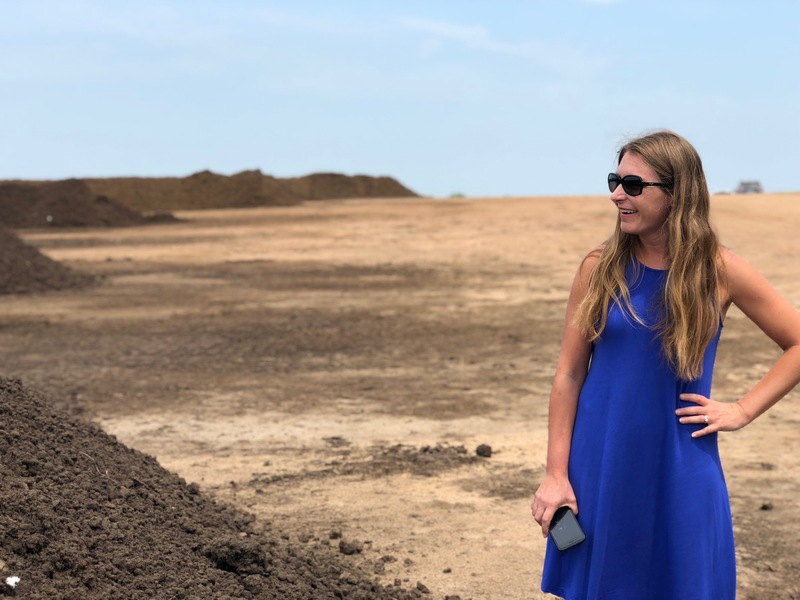 Spreading layers of soil and mulch takes time, and you should be realistic about the amount of time you budget for each task. This was preparing the beds in front of my porch in 2011. Also, estimate the cost for the supplies. This is an important bit of information that cannot be ignored. From personal experience I have often not taken into consideration the realistic costs of me doing a project, both in time and money. After crunching the numbers I came to realize it costs more for me to do it than to hire a professional from the start! Eight years later, and this bed in front of my house looks much different but orderly, thanks to years of strategic planning. Next on my dream list - extending this porch! On my spring to-do list I have many projects. Some are huge and will require a scaled drawing and hiring a professional team. Others I can take on myself so long as I allow enough time. You can see the difference between my “dream board” and what I lovingly refer to as the “achievable goals” noted with an asterisk. My spring plants are almost ready to help me fulfill my achievable goals for the spring. 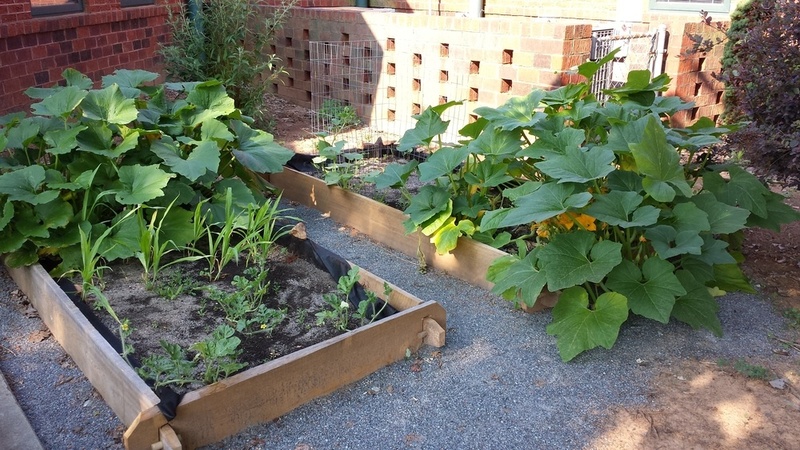 The need for weeding never ends, but adding a layer of mulch can help suppress those weeds in all of your beds. It is important to sprinkle in easy to accomplish tasks to stay motivated and feel like you are making progress. For me, the satisfaction of crossing something off the list is almost as good as seeing the project completed. Once you see your landscape looking something like this, you'll realize the scale of project you once tried to take on yourself. Many homeowners like to take on projects that are beyond their abilities – either in expertise or time availability. This is why understanding the task at hand, and all that is involved to finish it, is so important. Recognizing when to hire a professional is an important skill and can save you time and money in the long run. I like to use my own experiences as an example. I am now tending my third garden since 2005. The first two I built entirely from scratch, using the tools I had inherited over the years and my own man power. 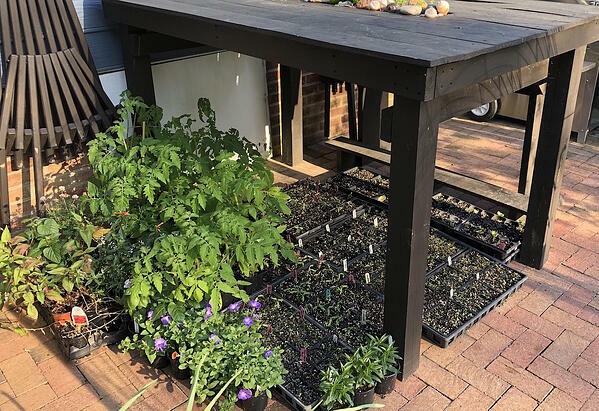 I made thousands of mistakes including not removing the warm season grass and layering sub-par, often disease- and weed-seed-contaminated soil in the beds because I was anxious to plant. In both of my previous gardens I created a monster because I didn’t recognize the planning process. 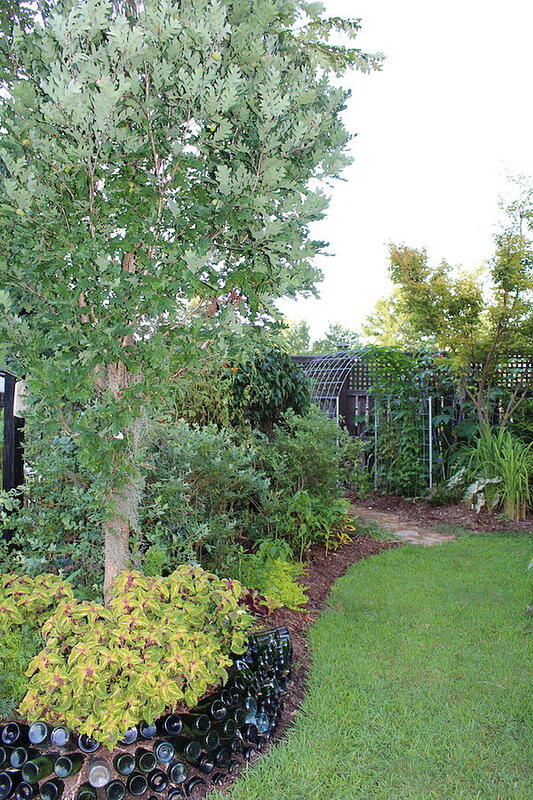 The result was a high-maintenance landscape that always looked like it needed to be cleaned. When I set out to break ground on my current garden my wise-beyond-his-years husband intervened. He saw after looking at my property-wide plan that we could not afford to take on this project without the help of professionals. 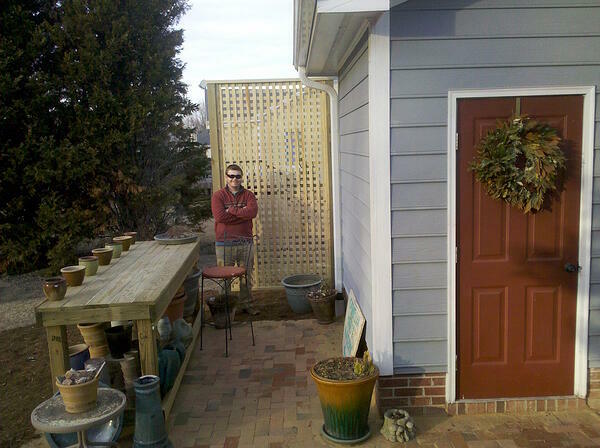 My husband on our new brick patio in 2011 after he wisely convinced me that hiring a landscape contractor was the best choice for this project. I know, that sounds like a contradiction. 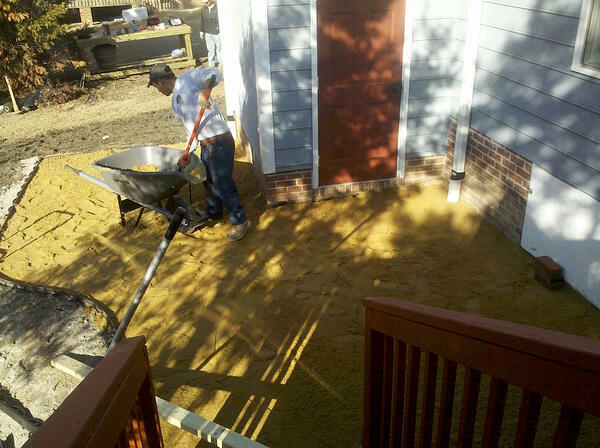 But the reality is a landscape contractor has the tools and the team to do the job efficiently. We did not. We also did not have the time, considering we both worked full time jobs. 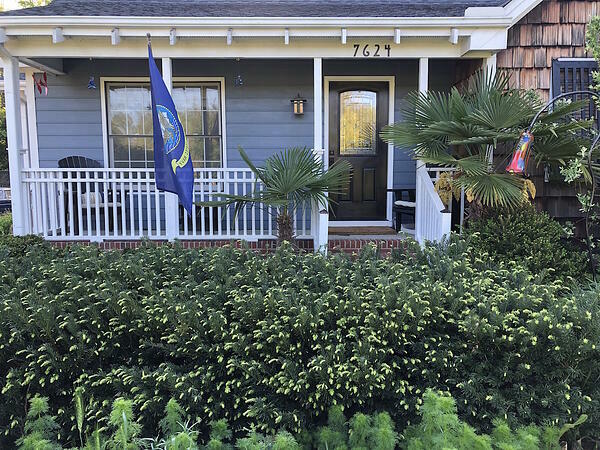 We opted to hire a contractor to remove the sod so that it could be reused on other projects, build a brick patio, enhance the soil and plant the largest tree and shrub specimens. What would have taken us months was accomplished in 4 days with a team of 5 knowledgeable professionals. The team of 5 professionals started and completed the project in 4 days. Within a week of the ground breaking I was able to start to enjoy the garden rather than feel burdened by it. Now 8 years later I look back and realize that was the best decision we ever could have made. We continue to approach home projects with the same sensibility. Identify what the project entails and how much time and resources it will take. Are we capable of completing it? Do we need to budget to hire it out? Is our time at work more valuable than our time working on this project? Can it be done in phases? Thanks to the foresight of creating a plan and phases of carrying out that plan, my backyard beds have a cohesive look. 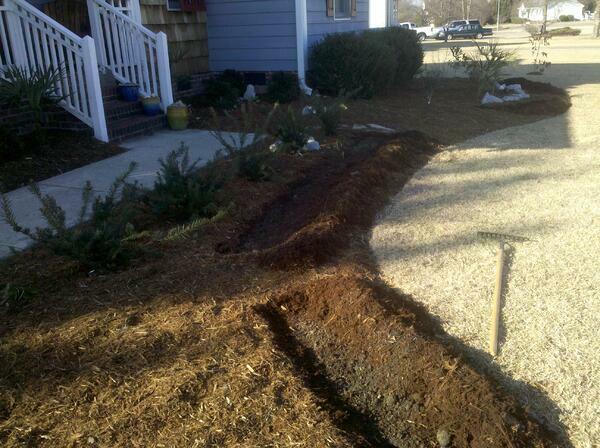 The great thing about landscape renovations is the ability to phase them out over time. As a designer I was frequently hired to create a property-wide plan, drawn to scale to show the main concepts, hardscapes, and plantings. This plan could be submitted to an HOA review board for approval or simply be used as a base map for the homeowners to take on one area at a time. This makes the task of locating and transporting plants much easier, plus it can be done in a weekend so you will feel the joy of accomplishment. The most important part of your spring garden planning is the soil! 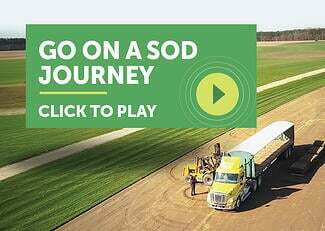 I always send a soil sample to to the NC Soil Lab. * If you’re not in North Carolina, you can contact your local Cooperative Extension office for soil testing. *Editor’s note: We also love Waters Ag Laboratory for a reliable soil sample with clear results. 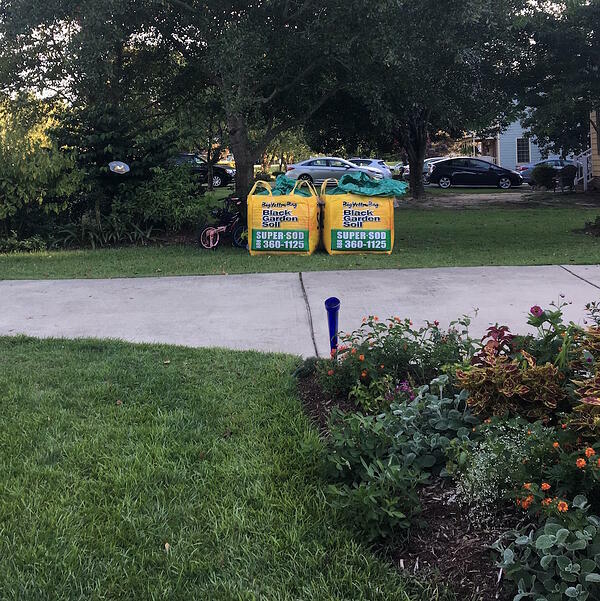 I always keep a couple of BigYellowBags of Soil3 on-hand for amending my soil in beds and containers. 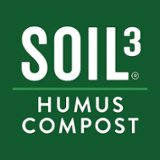 Once you have those results, order your Soil3 for home delivery and get started topdressing with the best compost available. This will ensure strong plant development and reduce your need to fertilize and irrigate. Plus, it makes planting a breeze! Remember, you do not have to till the compost in, let the plant roots do the tilling for you. Work smart not hard- let that be your spring 2019 motto! For more tips on spring planning, tune into my Soil3 Instagram takeover on Friday, April 19. 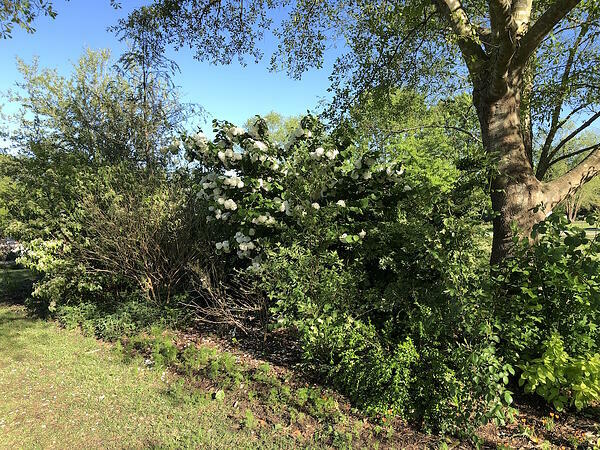 I will be sharing advice from my home garden on what to do and what not to do to make this your most beautiful spring ever. Until then, happy planning and planting!